There’s something special about the aroma of scalloped potatoes, as it drifts from your kitchen to every room in the house. It’s almost like the way a loyal pet can make a house a home. 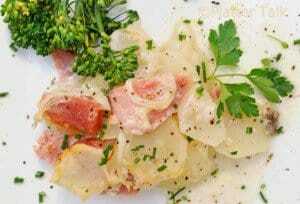 This Slow Cooker Scalloped Potatoes and Ham recipe does the same thing. Using this recipe you can return from a long day away and know instantly that you are home. Just like many other slow cooker recipes, just put the recipe ingredients together and then walk away. It’s that simple! If you’ve ever given pause to consider the wonderful meals you can create in a slow cooker, often times for a buck or two per serving, it’s truly remarkable. 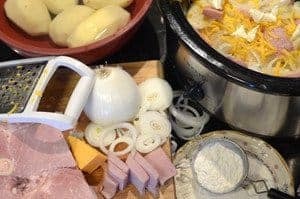 With this Slow Cooker Scalloped Potatoes and Ham recipe, we are thrilled to learn of one more creation that can be added to that very special mix. For thickening purposes, use a fine mesh strainer to add flour to recipes like this one, gravy, mac and cheese, etc. This will give a smooth consistency and help to prevent lumps! Turn slow cooker on high setting, spray inside of crock with non-stick spray. Peel the potatoes, allow to soak in water until you slice them. Thinly slice onion and have some flour ready to sprinkle, in a small kitchen strainer. 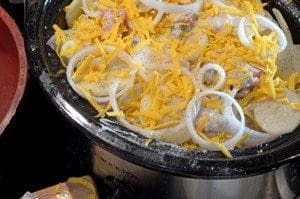 Place a layer of thinly sliced potatoes in slow cooker, top with a layer of onions, then sprinkle a thin layer of flour. Repeat process, adding shredded cheese, bits of cream cheese, ham, salt and pepper. Midway through process, pour half of milk and soup mixture over contents of slow cooker. Reserve other half for topping off ingredients just prior to final layer. Sprinkle each layer with a little flour, throughout. This will help thicken the scalloped potatoes. This simple meal is complete with bread and a fresh salad! 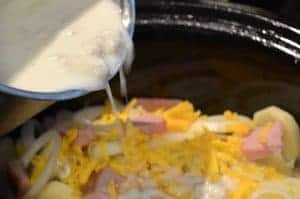 On the advise of our kids, we are sharing this Slow Cooker Scalloped Potatoes and Ham Recipe with you. Try it and and I think you will understand why our entire family loves this hearty and satisfying meal. Please give this recipe a try and be sure to share your comments below! 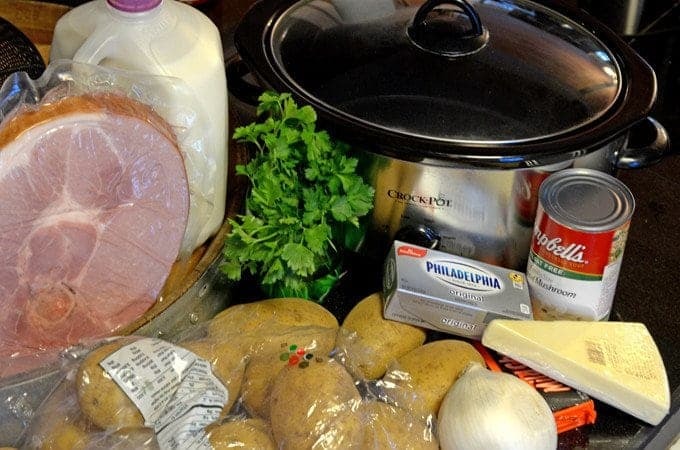 Comfort food from your crock pot. Spray inside of crock with non-stick spray. Combine soup and milk in small bowl, stir to thoroughly combine, set aside. Place layer of potatoes on bottom of crock, top with a layer of onions, salt and pepper, followed by a thinly sprinkled layer of flour. Evenly distribute a few chunks of ham, followed by a layer of shredded cheese. Repeat process, adding some of the chunks of cream cheese throughout. At halfway point, evenly distribute 1/2 of milk and soup mixture on top of contents. Reserve remaining amount. Continue layering process and evenly distribute remaining milk and soup mixture at the end, top with a final layer of shredded cheese. Cover and cook for 6 to 8 hours. Remove cover during last half hour or so, if necessary, to reduce liquid. Garnish with optional parsley, if desired. Serve and enjoy! Be sure and check out our Baked Version of Scalloped Potatoes, it’s just as delicious! 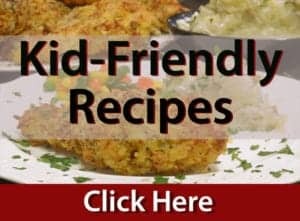 What size of crock pot is required for this recipe (8 servings)? I’m thinking of doubling it to bring to a workplace gathering. Would double the recipe fit in an 8 quart crockpot? Yes, that should work just fine. 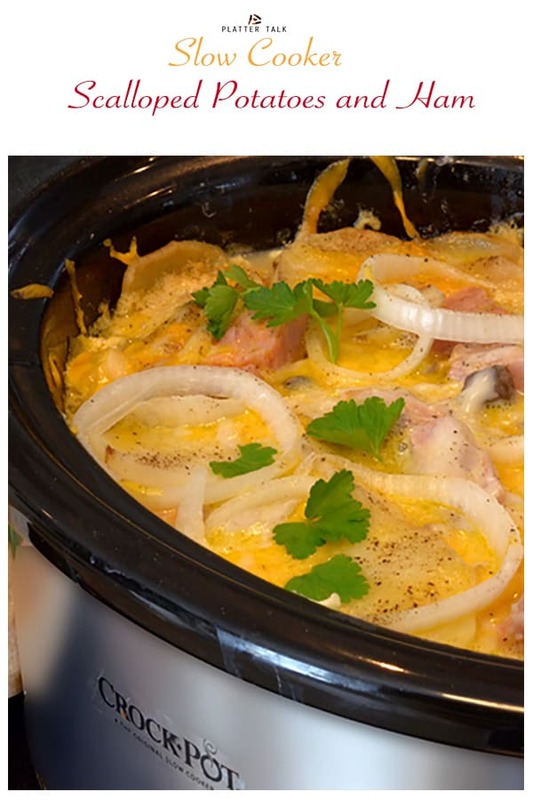 As you can see in the recipe video for this crockpot creamy chicken recipe, we use a 6 quart crockpot and still have plenty of room. 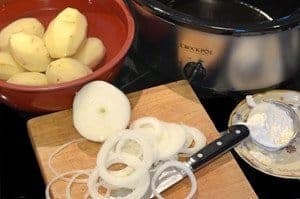 I love these potatoes and have never made them right I am going to try these tomorrow night thanks for posting a slow cooker recipe for them! 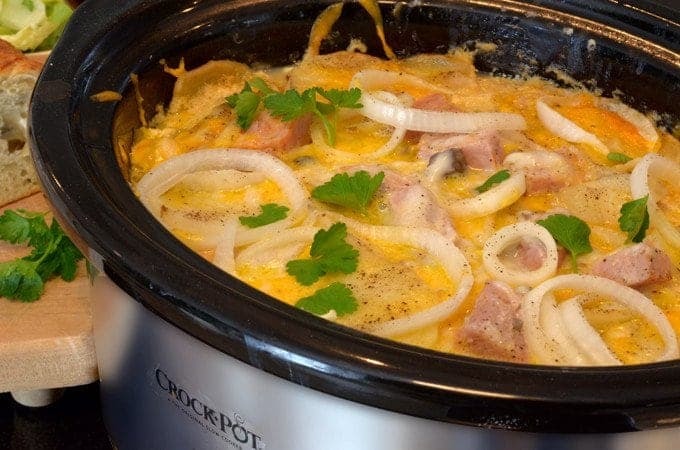 This looks so good and I love that it can be made in the crockpot! So many amazing flavors in here! Thanks, Ashlyn. Aside from the taste and convenience, these also bring an amazing homey aroma to the whole house! The kids gave you great advice! These potatoes are creamy, cheesy and delicious – and effortless too! Slow cooker meal (because these do look like an entire meal!!? Perfect! It’s definitely a favorite in our household! These came out excellent. I used only one can of cream of mushroom because I forgot one and a pint of half and half and I used Johnny garlic spread spice because we were camping. Also, almost 2 bags of cheese to use up some American and Cheddar I brought with us. Definately, need the full 6 to 8 hours. Think they were done at at about 7. Takes a while for cream cheese to melt. Yummy! Thanks for the great feedback, Laurie. We are happy you liked this recipe! Carol, either of those substitutions should be fine. Thanks for reading Platter talk! I’m so glad it’s time to get the slow cooker out again. I’m so obsessed with it come Autumn! These scalloped potatoes look fabulous, so full of flavour and creamy! I love cheesy scalloped potatoes with ham! I’ve never made them myself and am happy to know it can all be done in the slow cooker. Thanks for the inspiration! I love using my slow cooker. What a great classic combo. This makes for easy entertaining during the busy holiday times. Oh this looks so warm and comforting! I love ham and cheesy potatoes! I can’t wait to try this. When I was young I my mother was a pretty terrible cook (she knows it). Scalloped potatoes was one dish in particular that she tormented my taste buds with. What she served was a soupy gray slop with under-seasoned potatoes. As a child I couldn’t understand what made the dish so popular with people. 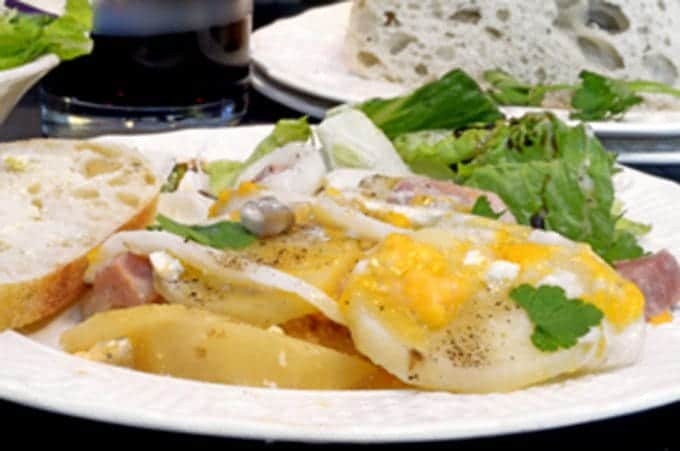 Only recently, as an adult, have I finally come around to find the joy of a properly prepared scalloped potato dish, and I could totally dive into yours! It is still hot here, so I avoid the oven. Crock pot is the way to go. Ham and scalloped potatoes is a favorite. Agreed, Amanda! Thanks for the comments! These potatoes look out of this world good. Bookmarking this recipe and making it next week. Thanks! My reaction was the same as yours when I first tried these, Igor! Thanks so much for the comments. 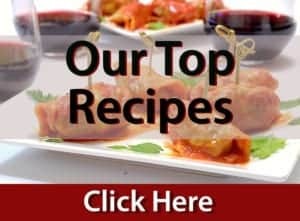 I have been looking for some good Crock-pot recipes. I can’t wait to try this. My whole family will love this. Thanks, Katie. I’m pretty sure you’re right about that! 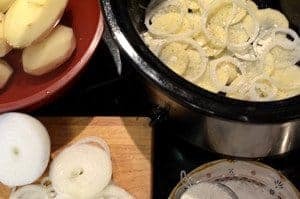 I just love a good scalloped potato and I also love to use the slow cooker, this recipe is a dream! Definitely must try- soon! Thanks, we hope you like it! Looks delicious! 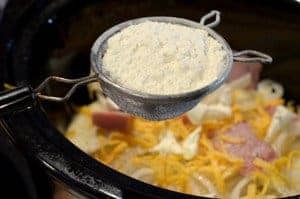 I love crockpot meals they are so easy! Like you say, you can get 10 meals out of a pot so it’s so economical! Thanks so much, Beth; we’re totally on board with what you’re saying! Do not show this to me! Potatoes and cheese are my downfall! I could eat the whole pot! True comfort food. So tasty. I am about to buy a slow cooker. Your recipe looks so simple to make and delicious. My family would love it :). Thanks for the comments; we hope you try this one! Cream + Cheese! Total goodness! The dish looks so great! Thanks, our family thought so too! Mmm scalloped potatoes are the best! Love how you’ve adapted it for the slow cooker! Thanks, Elizabeth! We hope you give these a try. Wow, I’d love to come to your house for dinner. This recipe sounds amazing. Did I mention that I’m all about slow cooker recipes, too?! We would love to have you, Jessica! Thanks for the great comments! I am not a fan of potatoes but I would sign up for anything with cheese in it. Great stuff! My family is going to love it. Indeed! Thanks so much for dropping by! 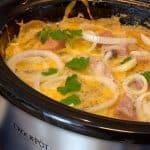 Love the slow cooker and I am loving this recipe! I love scalloped potatoes and these sound really simple to make! Thanks for sharing! Thanks so much, Angela; I hope you try these! You need to add one thing to your bullet points – fabulously easy! :D. Love that I can make it in the slow cooker, pinning. Thanks, Debra; you’re exactly right! This type of recipe is perfect for using left-over ham too. Yes Patty, you are so right. The beauty of your point is that it works both ways; we enjoyed some delicious ham sandwiches last week too!